I could end this review right here, and everyone would be nodding their heads up and down saying, "yep, that pretty much sums it up". If you care about your writing instruments at all, then at some point in your life you have used a Pilot Precise. It is one of the best writing, best looking, best all-around pens to have ever been produced. This pen brings me back to some of my first pen addict memories. When I first discoverd this pen, I knew it was the one for me. Heck, it may have even been a life changing moment, from a writing perspective at least. I'll never forget the ivory colored barrel and the little porthole in the cap that remains a key design element to this day. My biggest challenge when I was younger was trying to find this pen in purple, especially since it was one of the few nice liquid ink pens you could get your hands on. I'd check the bookstore shelves every chance I got looking for them, and made sure to buy at least two when I found them, not knowing when they would sell out and not come back in stock. Fast forward to 2010 and this pen still rules the roost as far as liquid ink pens go. I understand some people will never take a liking to the needle tip of the Precise V5 or V7, but you are missing one of the smoothest writers around. Another plus - this is one of the best Moleskine pens I have ever used. Moleskine paper is generally crappy, especially with a lot of fine tip gel pens, but this one just glides for pages and pages. What more is there to say? Pilot Precise - you had me at porthole. 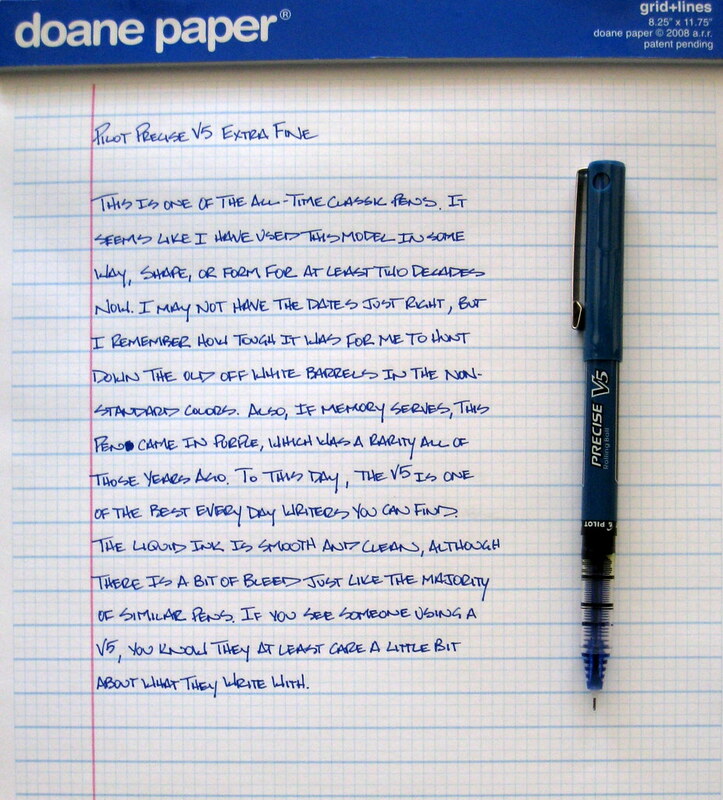 Posted on October 27, 2010 by Brad Dowdy and filed under Pen Reviews, Pilot, Precise V5.